How can I differentiate the parasitoid mummies from each other? The mummies of the different parasitoid species can be differentiated by their color and shape:Aphidius mummies are brown/yellow colored with a round shape. Praon volucre mummies are white colored with a cottony cushion at the basis. Aphelinus abdominalis mummies are black colored and oval shaped. What does the “Best Before date” mean? A “best before” date can be found on our XxxProtects. This date is notan expiration date. It is the date from which the quality of the product (% of emergence) starts to decrease. At this date, the emergence rate is still higher than 85 % for all species. The “best before” date is defined by the species included in the mix with the lowest conservation tolerance (A. colemani). Considering the quality decline, the best before date is generally eight days after shipment from Viridaxis. 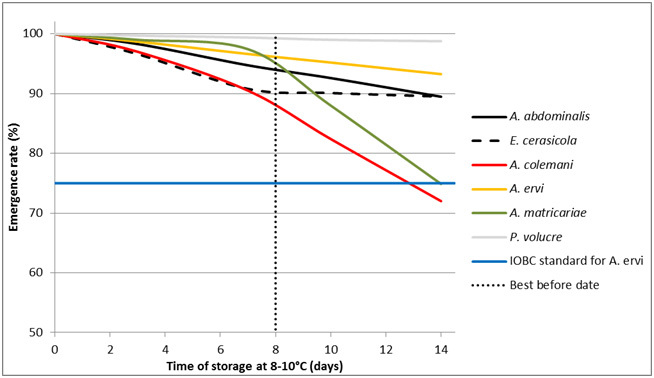 Figure 1: Decline of standardized emergence rate of the parasitoids with time of storage at 8-10°C. The emergence rate stays higher than the IOBC specification for quality control even five days after the ‘best before’ date (Figure 1). Viridaxis makes every effort to guarantee that the growers receive their products before the ‘best before’ date. If the tubes are installed in the crop on the ‘best before’ date or slightly later, the only risk is that some adults could have emerged in the tubes and are in consequence ready to explore the crop as soon as the tube is open. Why is it so difficult to find mummies of Ephedrus cerasicola? How do I install the tubes in the crop? When do I have to start releases? What is the release calendar? Key in natural aphid control is the use of XxxProtects in a preventive strategy: Releases should start as soon as the plants are installed in the crop or when plants restart their vegetative activity after the winter period. All XxxProtects have to be installed BEFORE you see aphids.FresaProtect and BerryProtect have to be released every three weeks. BasilProtect, VerdaProtect, and OrnaProtect have to be released every two weeks. Important is to leave the tubes at least for four weeks in the crop. How many tubes do I need per release? One tube of any XxxProtect covers 200 square meters. Where do I have to put the tubes? Avoid that the tubes get wet (sprinklers, condensation dripping spots). How can I store the XxxProtect upon receipt? The XxxProtect tubes can be stored at 8 to 10°C for up to two days. Do not put them in the refrigerator, as temperatures are usually well below 8 °C. Are there important points to consider for the introduction?